If you've read Foothill Agrarian since it's inception (way back in 2009, believe it or not), you'll have likely read a few posts by our interns. We haven't had interns for some time now, but we were lucky that a UC Davis student, Rebekah Velasco, approached us this winter about doing an internship for credit. She's been a quick learner and a delight to work with - here's her story! My first ever piece of mail was a postcard from England featuring the image of a lamb on a foggy rolling green. It had been sent from my mom while on a heritage chasing getaway with my dad, one of the many tendencies in their relationship I have long since admired. According to my memory, I was around four years old. My first ever souvenir was a tuft of wool she had retrieved from a fence post that was part of an enclosure surrounding a shepherd’s flock. For some reason, this lifestyle and these creatures reminded my mother of me. Perhaps because at the time, I was to her a lamb to its ewe. Perhaps it was something more of a motherly intuition of who her young daughter might become. Fast forward to my own heritage seeking escapade, on a bicycle touring through the Basque region of Northern Spain while on the Camino del Norte, a lesser known approach to Santiago. It was the summer before I set my mind to finishing my degree, and I knew I needed to root myself in something profound before I took that plunge. There’s no describing the way I felt across that landscape. Physically, it was as if I were home. My body relaxed into it, I blended in, was treated as though I belonged, and my last name fluttered by me on business signs and monument plaques. At that time, I hadn’t made the connection that the identity of the Basque people was so closely intertwined with the raising of sheep. I just knew that it is the region of my father’s name, and for that alone I craved it. Fast forward again, to the present. I am in the throes of my last push to graduate. What led me to study international agriculture initially was an intense love of plant life and the soil that nurtures it. Again, likely from an early influence from my mother’s gardening habit, I have dabbled in plant related careers for the vast majority of my adult life. As a florist, plants are my art. As a farmer, plants are my sustenance and income. But as a student, I found myself lost. Early on in my arrival at UC Davis, I secured a dream job as a research assistant in the agroecology lab. Aside from the unbelievable quality of the team, the science was fascinating. After meeting with the lab’s director and expressing a desire to grow, I was challenged with the task of defining a direction within agriculture to which I could devote a closer look. I left that meeting knowing that the space had been granted me to grow, and that I had intentional and deliberate thinking to do. It took months for me to come to a conclusion. I first met Dan Macon as a guest lecturer in my Rangeland Ecology class. What initially drew me in was his conversation around predation. He was thinking holistically, and out of the box about methods for control. I found myself entranced into the pictures that enhanced his presentation, of rolling green landscapes dotted with sheep, so reminiscent of the Basque country and my first postcard. His logistics were clear and accessible, though rooted in hard and careful science. 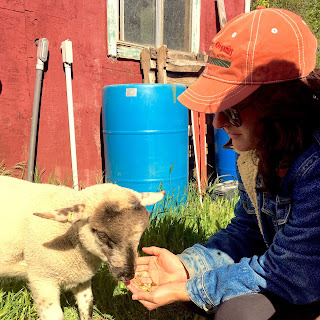 The lab portion of the range class series took us to his property where we watched his dogs in action, had a chance to handle his fencing infrastructure, and were able to feed new bottle lambs who his lovely veterinarian wife had been tending at home. That night I posted a couple pictures online and captioned them with “the future is coming into sight.” That was my aha moment. I would focus on sheep. But I knew nothing about sheep. It was an act of blind hope and trust to reach out to Dan. I had realized in my time at UC that its most valuable components of education were in the people, in the intersection of collaborative minds. As I started to see the light at the end of the tunnel, I knew it was my last chance to try. Dan and Roger welcomed me to Flying Mule Farm, put me to work, and watched. I was intimidated at first, fumbled with the fencing, and realized how unprepared I really was. Part of my international (and domestic for that matter) experience has been the realization that the obstructions of dissemination of information to the people are a major issue - not for lack of want, but for lack of ability. The structure in place to mitigate that issue takes the form of cooperative extension. I had heard through the grapevine that it takes a certain kind of person to do that job well, one who goes above and beyond the expectations, has ease engaging with the public, and who builds their knowledge not only from reading but from practice. These qualities became abundantly apparent in Dan and Roger as I attended their workshops, was quizzed on my game plan, and experienced moments in the field that were deliberately slowed in order to make room for an explanation, identification, or just quiet absorption. I realized that part of their conviction as partners and as advisors was a willingness and dedication to point anyone who asked in the direction of a deeper understanding of what it takes to make this lifestyle feasible. I’ve learned more detail over the course of this experience than I could ever get you to read here. I will spare you the regurgitation. The summation of my take-away is this: develop a system. Eat it, drink it, breathe it. Adapt it when necessary. Be observant and proactive. 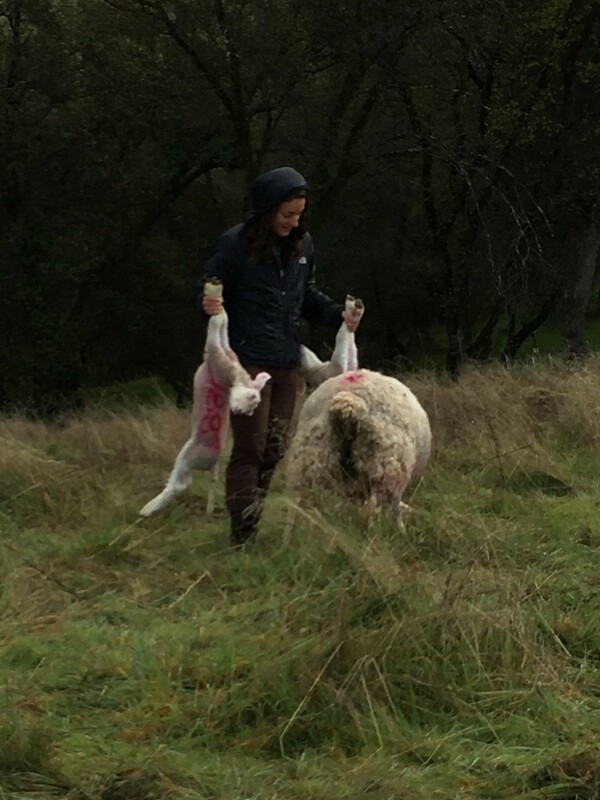 A shepherd, or shepherdess, must know their flock, keep an eye on their health, be anticipating their needs and have a plan in place to meet those needs. Like a parent, they must make efforts to protect and to enable. They make hard decisions, deal with loss, and build community to which they give and from which they receive support. They step outside of themselves and assess their own growth and role within the partnership. They communicate about what risks are worth taking, and what decisions yielded successful outcomes. They grow ever more efficient. I know now that my future holds within it my own flock of sheep. I know that I will draw from this experience then, and apply what I’ve seen to my own management practice. I know that I’ve got a great deal of learning left to do. But I’m not overly eager to arrive at the destination. For now, I’m enjoying the journey.